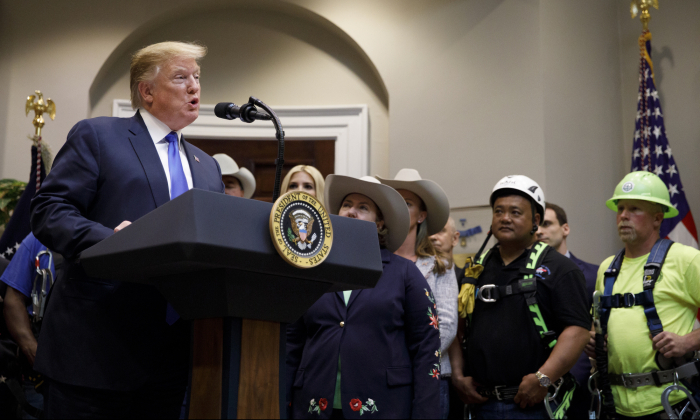 President Donald Trump said on April 14 that the U.S. economy would have grown at a greater rate if it weren’t for the policies of the Federal Reserve, which repeatedly raised rates last year while selling off assets. “If the Fed had done its job properly, which it has not, the Stock Market would have been up 5000 to 10,000 additional points, and GDP would have been well over 4% instead of 3%…with almost no inflation,” Trump wrote on Twitter. “Quantitative tightening was a killer, should have done the exact opposite!” the president added, referring to the Fed’s bond selloff last year. Trump frequently criticized the central bank last year as it continued to raise interest rates. The president’s pressure hasn’t let up. On April 5, he again called on the central bank to lower interest rates. The Fed raised interest rates four times in 2018, but also has put that process on hold, leaving the target policy rate at a range of between 2.25 and 2.5 percent. During the eight years of the administration of President Barack Obama, the central bank held interest rates at historic lows, raising them slightly just before Trump won the 2016 election. The Federal Reserve also regularly sold about $50 billion in bonds on a monthly basis last year, pulling liquidity from the market. The rate increases and the asset selloff contributed to a stock market downturn at the end of 2018. The Dow Jones Industrial Average dropped more than 20 percent from October through December. That loss was almost completely erased as the Fed shifted gears, and the Dow is now just about 1.5 percent below the record it set on Oct. 3. Congress established the Federal Reserve to prevent boom and bust cycles, but the central bank’s policies have consistently resulted in the crashes and recessions it was established to prevent. Trump has the power to reshape the Fed by appointing members to its seven-member board. To date, three Trump nominees have been confirmed to the board: Jerome Powell, the chairman, Richard Clarida, the vice chairman, and Randal Quarles, the vice chairman for supervision. Two seats on the board remain vacant. Trump said he intends to nominate Stephen Moore and Herman Cain for the two vacancies, but hasn’t yet sent a formal nomination to the Senate. Unlike the president’s prior nominees, Moore and Cain have openly criticized the central bank. Like Trump, both Moore and Cain believe that returning to the gold standard would be better for the U.S. economy than the current fractional reserve system under the Federal Reserve. Before announcing his presidential bid in 2015, Trump said returning to the gold standard “would be wonderful,” but hard to do. Under a gold-standard banking system, the value of the dollar is pegged to gold held by the government. Cain wrote an editorial for The Wall Street Journal in 2012 calling for the return to the gold standard. Cain argued that while the gold standard system has its flaws, historical data shows that American economic growth was stronger, unemployment rates were lower, and recessions were less frequent and severe than under the Federal Reserve. President Richard Nixon abandoned the gold standard in 1971.